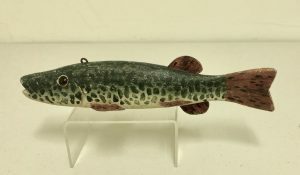 7 1/2″ Ice Fishing (spearing) Decoy from the upper Mid West. 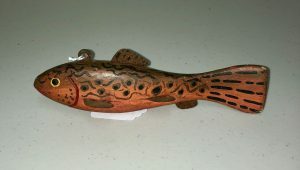 Last quarter 20th C.
Nice color 7″ ice fishing (Spearing) decoy from the upper Mid West. 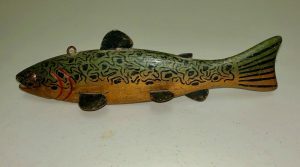 81/4″ long ice fishing (Spearing) decoy from the upper Mid West. Last quarter 19th C. A nice working decoy. 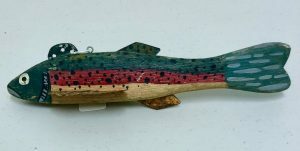 Large (11″) decorative ice fishing (Spearing) decoy, missing one fin. Glass eye. More of a decorative decoy than a working one. Upper Mid West. 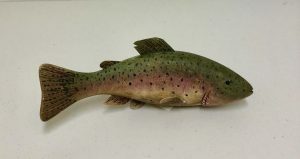 8 3/4″ long ice fishing spearing decoy. painted eye. Upper Mid West origin, last quarter 20th C.
Rare surviving 1/2 pound Snuff Pack. 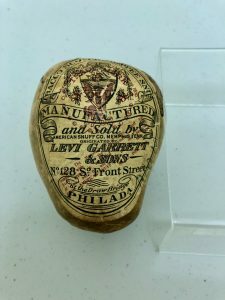 “LEVI GRRETT & SONS, NO 128 SOUTH FRONT STREET, PHILADELPHIA” . Retains full label and US Interbal Revenue Stamp. Tobacco leafwrapping all in tact. 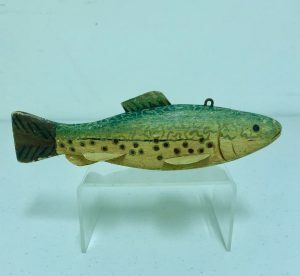 Nicely carved and painted ice fishing (spearing) decoy in a larger size – 9 3/4″. Found in Illinois but likely from Minnesota. Nice original condition with expected in use wear. 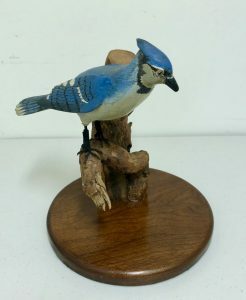 Large Blue Jay carving from a group of 4 bird carvings from a small town in Missouri, c. 1940’s. A 5th bird was signed “Webber”. Extra large – 11″ long” – ice fishing (Spearing) decoy. Found in Illinois, but likely from Minnesota. Good original condition with expected in use wear.